For decades grey has received a bad wrap for its seemingly uninspiring and sombre presence when used in the home, reminiscent of concrete and submarines. Well these days are well and truly over, and that grey has experienced an exciting revival in homes around Australia. At Taubmans, we’re loving the ‘new modern greys’; crisp greys characterised by a slight hint of blue, purple or green, that make them the perfect fresh and neutral base. In the true colour spectrum, grey is known as a shade rather than a colour, as it is mixed from varying values of pure black and white. Different combinations of black and white, as well as the other colours they are paired with, will affect the overall outcome and feel of a space, whether crisp, neutral, fresh, warm, cool, or relaxed. So, how can you use the new modern greys in your home? 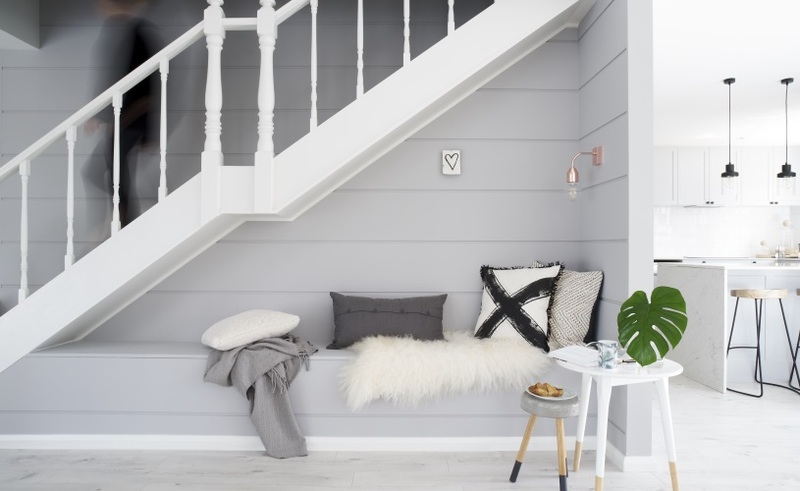 Here’ our top tips for understanding how to combine grey with accents to create a look that suits your style, in any room of your home. Black is a strong statement so compliment it with a grey that has strong percentage of white to give it impact. Add pure white in accessories and furnishings to introduce some softness to the strong scheme. Layering the look with texture in fabrics and patterns will contribute more softness, creating a balanced and modern room. Strong contrasts of red and orange work really well with dark grey. The combination works because they have a similar depth in tone and sit well together with an even value in intensity. Accessories like cushions and artwork in these hues will pop against a dark grey backdrop, and this will tie together all the elements in the room for a clean and punchy vibe. You can still experiment with the new modern greys if you are working with an existing neutral scheme with a beige base. We recommend using greys that are warmer so they don’t make the off white look too yellow. Limit the amount of pure white, as using too much will make the interior seem stark rather than crisp. Introduce natural elements like natural timber to give an earthy element, to contribute to the relaxed look over the space. Selecting the right white shouldn’t be confusing. But it is a simple colour that can make people nervous. Here are our tips for finding the perfect one for you. When used thoughtfully, neutrals can be stylish, simple, elegant and timeless, while still reflecting the personalities and individual styles of homeowners. The trend for painting feature walls has evolved over the years from just a single wall, to a more dynamic injection on two or three walls and, more recently, to less static use of colour. Using paint for patterns and shapes is a relatively simple painting task to take the interior of your home to a whole new level of impact, without having to paint entire rooms.